When everything clicks for the Timberwolves, it’s beautiful. When it falls apart, it’s ugly. This isn’t going to be one of those “same old Timberwolves” laments that keep cropping up on Twitter in the midst of Minnesota’s 1-3 start. That would be easy, I suppose, since we’ve seen a full season play out the way this one has started — narrow losses, blowout wins, great individual play — in the 40-victory 2013-14 season. But it’s too early. There are too may variables. This is not that. But this year, so far, is this: four games in which you can see a great deal of individual improvement without seeing yet how it all fits together in a team concept. 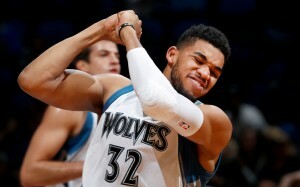 You can see that Karl-Anthony Towns worked tirelessly in the offseason, the fruits of that labor shining through in Thursday’s 32-point, 14-rebound effort. You can see how Andrew Wiggins has improved his range after his smooth and confident 2-for-3 shooting from three-point range Thursday. You can see how Zach LaVine wants to take over games. You can see what Kris Dunn has to offer. What you also see, though, is a group of individuals that doesn’t yet know how all of those individual things they’ve all been working on translate to a means to stopping runs, extending leads and closing games. There’s a lot of isolation, no perfect pecking order and a lack of defensive resolve. It’s almost as if this is a young team playing for a new coach in a new system (and without its starting point guard) — which is to say, that is exactly what the Wolves are, and we shouldn’t be surprised by this even if we can be disappointed. It’s not a lack of effort. It’s not a lack of talent. It’s a lack of reps, which leads to inconsistency. When everything clicks, it’s beautiful. When it falls apart, it’s ugly. That’s how you wind up with a 36-point win and three losses by four points or fewer (all of which featured double-digit Wolves leads early). If it still looks like this in February, let’s worry more.